On the same freezing February day in 1968, Wendy Carlos, Suzanne Ciani, and John Mills-Cockell all stopped by Robert Moog's studio to acquire his latest prototype, the Moog Modular synthesizer IIP. And with it, all three trail-blazed new paths for electronic music. Carlos went on to bring the strange synthesized sound into public consciousness with the epochal Switched-On Bach. Ciani went on to use her Moog and Buchla synthesizers in commercials, creating unimaginable sounds that slyly infiltrated the public's subconscious. Now comes a look at Mills-Cockell's adventurous trio Syrinx, which pitted his Moog against the drums and hand percussion of Alan Wells and the electric saxophone of Doug Pringle. Syrinx released only two albums in the early ’70s before disbanding. And while RVNG’s wont is to plunder and cull unreleased tapes, so singular are these two studio albums that with RVNG's handsome 3xLP set, the label reissued them intact, with a third disc given to unreleased takes and a stunning live document of the trio performing with the Toronto Repertory Ensemble. 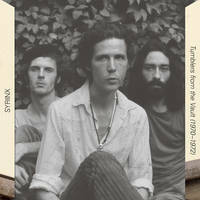 All but unknown in the US, Syrinx carved out a niche for themselves in Canada, sharing bills with the likes of Miles Davis and Ravi Shankar, while the brief cha-cha whirligig of “Tillicum” became the opening theme for a CTV Network documentary program, “Here Come the Seventies,” embedding its curious mélange of brass and circuitry into viewers’ ears. If the small number of composers and academics who got their hands on the Moog synthesizer wound up defining the early electronic music cannon, even fewer of them integrated the unwieldy instrument in a band or pop music without being labeled a novelty act. Silver Apples and the United States of America might be Syrinx’s closest contemporaries, but there’s a nimbleness and grace to the group that gives the sense of the group dancing beyond the confines of genre. It’s there from their very first number, “Melina’s Torch,” which feels wistful rather than weird. While electronics during this era were often deployed to mimic psychedelic mind states at their most intense and immersive, Mills-Cockell’s use of them instead suggests the contemplative comedown. There’s gentleness and elegance to numbers like “Journey Tree” and “Chant for Your Dragon King” that make for some of the most disarming experimental music of the era. The buzzing sine waves snaking through the uptempo “Appaloosa-Pegasus” suggest that the band could also venture into stranger climes. By the time of 1971’s Long Lost Relatives, they had abandoned the pastoral airs of their debut for a more imposing sound. “Tumblers to the Vault” is an apt title, suggesting a precision and physical prowess you can hear in the songs: Mills-Cockell’s Moog is as luminescent as jumping jack firecrackers while Wells’ hand drums and shook bells do pinwheels around it, all of it capped by Pringle’s sax lines nailing perfect somersaults between the two. The better part of Tumblers is given over to three versions of “December Angel,” a nearly ten-minute journey that appears in studio version, demo and live rendition with an orchestra. Weird squalls introduce the studio version, Mills-Cockell getting his Moog to chime like a celeste. The demo version of the song, on piano, lays bare the melody at the heart of the trio’s music. But the live performance might be the most surprising, with space that allows for violins and bells to swell and sparkle in the firmament. Midway through, you'd be forgiven for thinking that Syrinx wasn't a groundbreaking group using the newfangled Moog to make mutant pop, but rather forward-thinking scholars of Debussy. Beyond being merely Switched On, Syrinx envisioned where electronic music would go decades later, being a pliant thing that at once eluded and embraced other genres, making them into a singular, impressionistic sound.